THESSALY, Pharkadon. c. 440-400 BC. Hemiobol. THESSALY, Pharkadon. c. 440-400 BC. Hemiobol (Silver, 8mm, 0.39 g 1). Bull’s head to right. Rev. 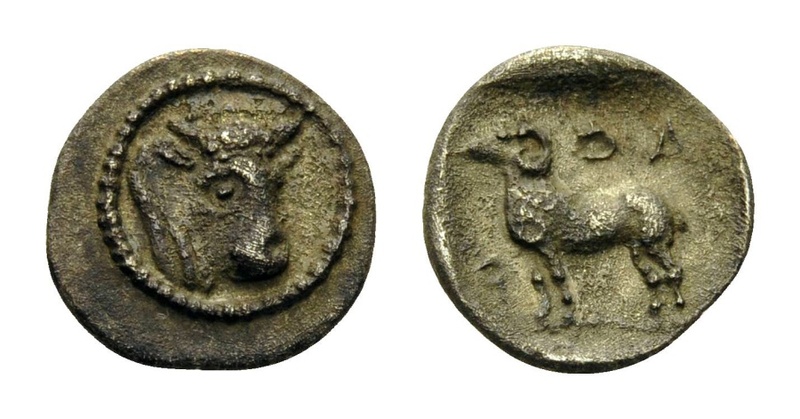 Φ-Α-Ρ-Κ Ram standing to left within incuse square. BCD 1270. Very rare. An attractive piece but with rough surfaces, especially on the reverse; otherwise, good very fine. PAMPHYLIA, Aspendos. Circa 420-360 BC. Obol. IONIA, Teos. Circa 320-294 BC. Diobol. IONIA, Magnesia ad Maeandrum. c. 350-325 BC. Obol. ARKADIA, Pheneos. Circa first or early 2nd quarter of the 4th century. Obol.